It was 9:45AM, and I was delighted to find Bill’s Shoe Repair still residing in downtown Lawrenceburg IN., an Ohio river town in extreme southeastern Indiana. After dropping off one of my favorite slip-on loafers for repair I decided to walk down a couple of blocks and climb the stairs to the top of the levee that holds back the river. As I sat on a bench alone on the top of the levee river walk, I’d just missed a barge plow through the current and turn the corner heading upstream for who knows where. That’s when it hit me; a profound connection with the relentless current of the mighty Ohio river was a glistening representation of a learning performance ecosystem. Well, at least I thought it profound. Maybe it was the 20-ounce Starbucks with two shots of giddy-up. I sat and studied the river as it flowed; powerful current in the middle where barge traffic traveled. The main current is where barge work gets done; the deepest part of the river handling both north and southbound traffic. Closer to the bank the current slowed; in some places stopped completely and swirled with river debris caught in eddies making no downstream progress. Call me twisted, but that’s what hit my brain. True, caffeine addled, but that’s how my posts originate sometimes. The parallels were remarkable. In the training paradigm, we (L&D) are on the levee determining what to do to ensure work (barge traffic or workforce performance) is accomplished in the current …at the Point-of-Work…in the deepest, relentlessly moving, most complex part of the ecosystem. Did I mention addled? Seriously, I mean really…seriously…no…zero…nada…business outcomes are generated during training. No training participants are ever at the Point-of-Work where outcomes manifest. Everybody is on the levee at Point-of-Entry pretending to be in the current where work gets done. We (L&D) have ventured closer but are at best in the eddies with micro-learning, adaptive learning, gamification, and such. But hear this…none of those are terrible things, they’re just caught in the whirlpools along the river bank, beside the levee, outside of the current of Point-of-Work…and making no measurable progress downstream with the flow of business toward workforce sustainability. Aren’t we after hard-dollar results? If we cannot move our training innovations closer to Point-of-Work, we need to regroup with a strategic re-think. 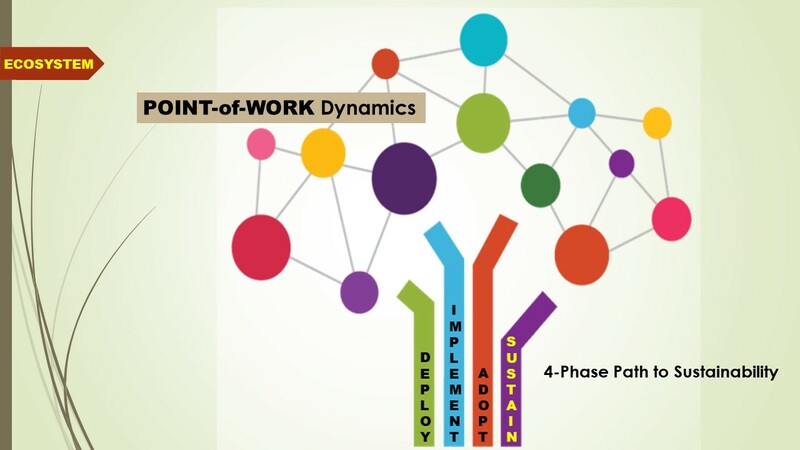 Why not leverage DPS technology and converge Point-of-Work with Point-of-Entry? My point here is a long way from rocket science, but it stuns me how so many miss the obvious solution. If we want to drive and sustain performance, we must be willing to swim out to the current where work happens. We must dive deeply into Point-of-Work and learn about the current of demand and understand the depth of complexity confronting our workforce at their moments of need. We can only understand those Point-of-Work performance attributes if we get off the levee and swim to the current. Want to know what to do when you get out to the current? Ping me, and I can coach you through the process of learning how deep and wide your challenges really are that training can’t touch. C’mon in…the water’s fine…never mind that cat fish that’s as big as a Buick. Want to just dip a toe in as a lurker, join the LinkedIn networking group recently launched at POINT-of-WORK Performance Support Solutions. ← POINT-of-WORK: Empathy at the Hands of Performance Support? As a sailor (on the Ohio River no less!) I love the comparison and offer an additional thought as I enjoy my morning coffee. Lurking below the current out of clear sight is debris carried along with the current that when encountered can stop a boat from moving forward and can cause damage to propellers, rudders, even holes in a hull. Supporting performance at the point of work and the time of need can create change to the existing current of work, the culture and unspoken roles of leadership. We need to be aware to the nuances of the current for culture can put holes into any effective performance innovation and sink a point of need solution. Be aware of the depth of complexity for the workforce as well as the depth people fear of becoming jetsam. You are exactly right, Bill, and if we don’t get out into the current we’d miss the sub-surface challenges and hidden cross-currents. Hard to fathom (sorry) any of that from the levee.